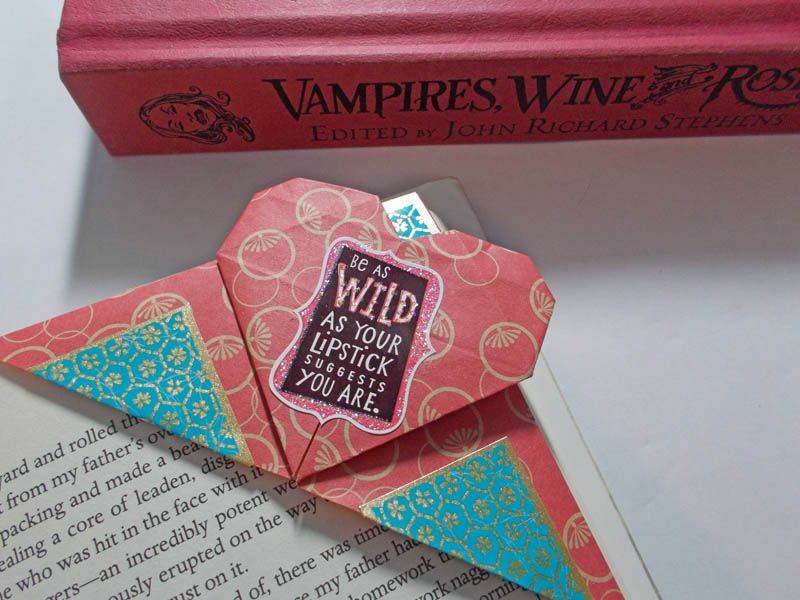 If you are looking for a small treat to give to your favorite bookworm, this origami heart bookmark is a great choice. It is easy to fold, but the heart embellishment makes it a bit more decorative than an ordinary origami corner bookmark. The origami heart bookmark in this tutorial is made from a single sheet of square origami paper. The best option is to use paper that is either 6 inches by 6 inches or 4 inches by 4 inches, depending upon how large you would like your finished bookmark to be. A solid colored paper or a paper with a subtle pattern looks best for this project; bold patterns detract from the simplicity of the heart shape. Fold your paper along one of the diagonals to make a triangle shape. Fold in half along the opposite diagonal. Flip your paper over so the patterned side is facing up. Fold it in half horizontally. The crease you make should go across the intersection of the "X" crease pattern you created in the previous step. Open your paper up. Fold the bottom up to the middle crease. Unfold the paper. Push in gently on the horizontal creases to collapse the paper into a triangle. This collapsed triangle form is known as a balloon base. It is used to create many different origami projects, including a basic origami butterfly. With the crease you made in Step 3 facing you, lift the top layer of the triangle upward. Flatten. This will eventually become the heart embellishment on your origami bookmark. Flip your paper over. Fold the top triangle flap down. Fold the top horizontal edge down so it meets the crease you created by folding down the triangle flap. Stick a finger in each corner pocket and flatten the paper. Fold the exposed corners in. This creates the two sides of the final heart shape. Then, fold the top left and right points down to round out the corners of the heart. Flip your paper over and bring the triangle flap back up. Congratulations! Your origami bookmark is complete. If desired, you can decorate the origami heart bookmark with stickers or write a message on it. If you use stickers, try putting a large sticker over the part where the two sides of the heart join together to prevent the reader from accidentally unfolding the bookmark. You may also want use a glue stick to glue the top of the heart to the triangle base. Origami heart bookmarks are fun to make throughout the year but would be especially cute as a handmade Valentine's Day treat. Origami heart lollipop covers are another fun idea for making homemade Valentine's Day gifts for friends and family.